Ross procedure has been at the center of a vivid scientific debate and the recently reported positive long-term results described in the literature favored the reappraisal of this procedure. However, issues of pulmonary autograft (PA) dilation and potential for reoperation are still harnessing the outcome of this operation. Controversial on its long-term effectiveness together with the technical burden carried by the procedure itself contributed to drop a veil of uncertainty on the future of this operation and triggered the surgical efforts of many groups in order to circumvent its drawbacks. Sub-coronary implantation of the PA, which might theoretically reduce the risk of autograft failure, is not applicable in children. Conversely, as clearly pointed by Siever et al., the implantation of the PA as a freestanding root is associated with significant adverse outcome in the long-term, mainly regarding neo-aortic dilation and regurgitation. Consequently, the use of external reinforcement of the PA has been strongly advocated but the strategies proposed until are based on the use of synthetic materials, as Dacron, which fail to match the biological requirements of a growing structure and dramatically compromise the native elastomechanical features of the ascendens aorta. Obviously, the solution might rely in a PA wall reinforcement that respect its biological features and at the same time, is able to produce in the growing neoaorta some structural modifications to tolerate the systemic arterial hemodynamic conditions. We recently introduced the idea of the use of resorbable scaffolds as reinforcement of the PA in an experimental model of Ross operation in the growing lamb [Figure 1]. A polydioxanone external mesh prevented PA dilation and induced in vivo a favorable elastic remodeling of the autograft. 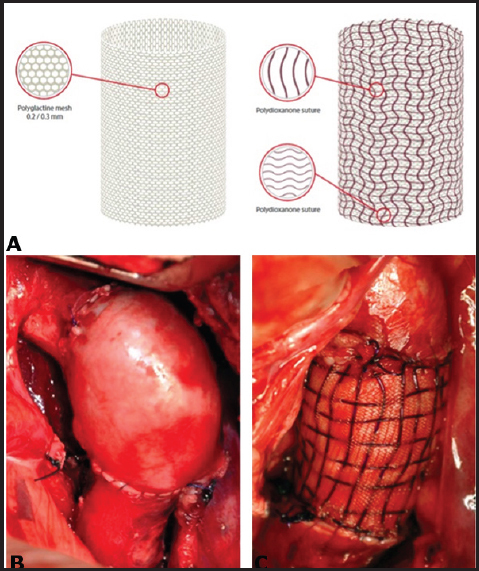 A complex histoarchitectural rearrangement of the PA including medial thickening and increase in the elastic wall component was triggered by the bioresorbable prosthesis, eventually leading to the creation of a "neovessel" with characteristics similar to the native aorta [Figure 2]. We could speculate that the biomaterial accompanied and accelerated the naturally occurring pressure-load adaptation phenomena, orientating the biological machinery toward an elastic response while still permitting autograft physiological growth over time. Even if in need of more confirmatory results, the use of biocompatible external reinforcements might constitute an innovative avenue to solve some of the drawbacks of Ross procedure. These materials are routinely available in the surgical practice and already approved for use in humans, allowing for a potentially rapid application to clinical scenarios. In addition, this concept might be extended to other conditions involving a pressure load conditioning of vascular structures normally bearing nonarterial regimens. With this in mind, the biological reinforcement might be used to prevent the complications of the arterial switch operations for transposition of great artery, which mainly regard neo-aortic root enlargement and regurgitation for the left outflow tract repair, and the onset of supravalvular pulmonary stenosis for the right ventricular-arterial junction reconstruction. In conclusion, we believe that instead of engulfing the literature with 10 years clinical follow-up of Ross procedure, a new impulse should be given to basic and translational research activities to stimulate the development of bio-artificial vascular substitutes and provide an immediate future for the Ross procedure. Authors wish to thank Prof Yves Lecompte, his expert consult. Nappi F, Spadaccio C, Al-Attar N, Acar C. The Ross procedure at the crossroads: Lessons from biology: Is Dr Ross's dream concluded? Int J Cardiol 2015;178:37-9. Sievers HH, Hanke T, Stierle U, Bechtel MF, Graf B, Robinson DR, et al. A critical reappraisal of the Ross operation: Renaissance of the subcoronary implantation technique? Circulation 2006;114:I504-11. Charitos EI, Hanke T, Stierle U, Robinson DR, Bogers AJ, Hemmer W, et al. Autograft reinforcement to preserve autograft function after the ross procedure: A report from the german-dutch ross registry. Circulation 2009;120:S146-54. Nappi F, Spadaccio C, Fouret P, Hammoudi N, Chachques JC, Chello M, et al. An experimental model of the Ross operation: Development of resorbable reinforcements for pulmonary autografts. J Thorac Cardiovasc Surg 2015;149:1134-42. Nappi F, Spadaccio C, Castaldo C, Di Meglio F, Nurzynska D, Montagnani S, et al. Reinforcement of the pulmonary artery autograft with a polyglactin and polydioxanone mesh in the Ross operation: Experimental study in growing lamb. J Heart Valve Dis 2014;23:145-8.